Hoary verbain (Verbena stricta) has been in my garden for three years now, and I enjoy it more and more. Some parts of our area got hit by thunderstorms this week, but all the rain passed us by, so the soil is pretty dry once again. I’m hoping for rain this weekend and early next week to refresh my new plantings. Established perennials and shrubs are doing fine, however. Milkweed, bergamot, and coreopsis are in full bloom; rudbeckia is showing buds. Native grasses are lush and full. — finish harvesting early greens such as lettuce, spinach, arugula, mustard greens, and mesclun mix, plus peas and radishes. As greens bolt, or go to seed, pull the plants and plant something else. A row of beans, perhaps? eggplant, beans, corn, and cucumbers: Monitor for insect eggs and larvae and remove them before infestations become serious. Throw out badly infested or diseased plants to prevent the spread of disease (do not compost diseased or infested plant material). Look at this post, this one, and this one for basic information about growing tomatoes. — harvest basil and make pesto! The little brown beetles that eat basil plants haven’t arrived yet, and the plants are nice and full, so cut them down at the base and make a nice big batch of pesto. It freezes beautifully, so you can enjoy the unmatchable taste of fresh basil all year long. The plants will regrow, so you’ll have fresh basil all summer. — water new plantings: Any week in which we receive less than an inch of rain, water all woody plants installed this spring or last season. Perennials planted last spring should be well-established, but those planted last fall and this spring need supplemental watering during dry spells. How do you know when we’ve received an inch of rain? I use a highly sophisticated rain gauge–an old yogurt container placed on the ground among the plants. A tunafish or catfood can works equally well. — it’s not too late to extend a garden bed or start a new one, and it’s always a great idea to eliminate some lawn: spread a 3-4 inch layer of cedar or hemlock bark mulch over the area to kill the grass. Then plant right through the dying grass and mulch. — follow a sustainable lawn care regimen: if you feel you must fertilize your lawn, best practice is to give it no more than two applications of slow-release organic fertilizer each season, around Memorial Day and Labor Day. It’s too late now to reseed bare areas: wait until early fall. Better still, if you have a place where grass won’t grow, plant something that will, like shade-loving native perennials. Let the grass grow at least 3″ tall for maximum photosynthesis. Lawns do not need water now (or ever), but if you do water, do it infrequently and deeply to encourage deep root growth. One inch of water once a week is much better than a few minutes each day. But remember: the more you water, the more you’ll have to mow! Most of all this week, take time to enjoy the garden. 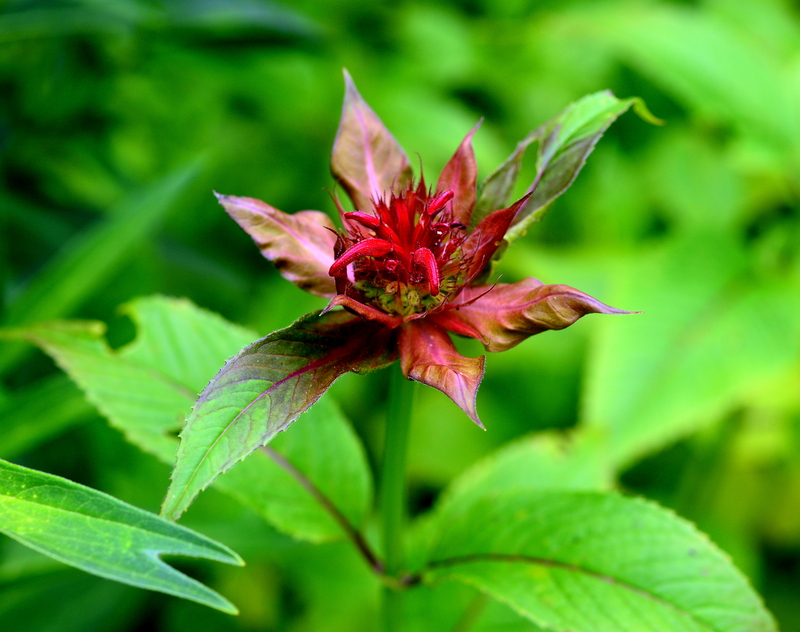 Another new plant in my garden, but I’m not so sure about this one: I looked for Monarda didyma, red bergamot, for years, and finally settled for this cultivar, ‘Jacob Kline.” The color is great, but the flowers are not entirely satisfactory. Spending time in the garden makes us all happy. 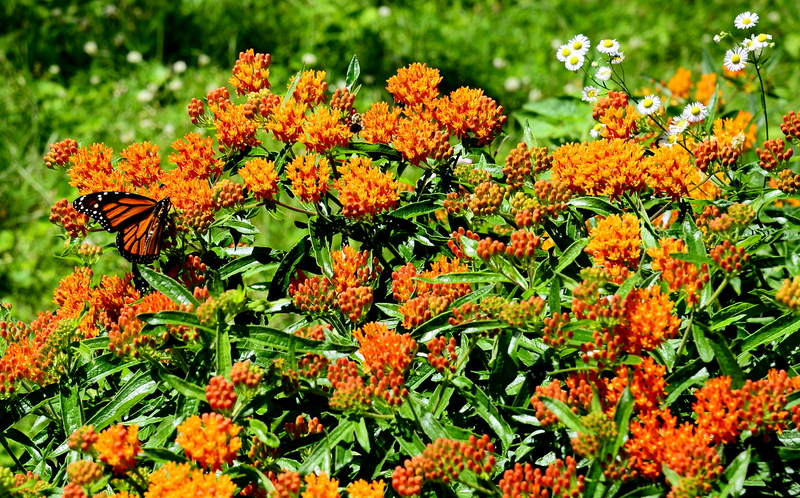 This monarch spent much of the morning checking out the milkweed plants in my garden and finally settled on this clump of orange butterflyweed (Asclepias tuberosa). The white flowers are daisy fleabane (Erigoren), a native annual. We used to see a lot of monarchs in our garden: in July, they’d come to lay eggs on the milkweed, and in September members of the next generation would stop to nectar on the asters and liatris as they migrated south. On a warm, still autumn day, we might see a dozen on a single plant. But in recent years their numbers have dwindled. I’ve seen perhaps one in the past two years. This morning the monarch you see here spent at least an hour in the backyard looking for milkweed–both A. tuberosa and A. incarnata are in bloom. 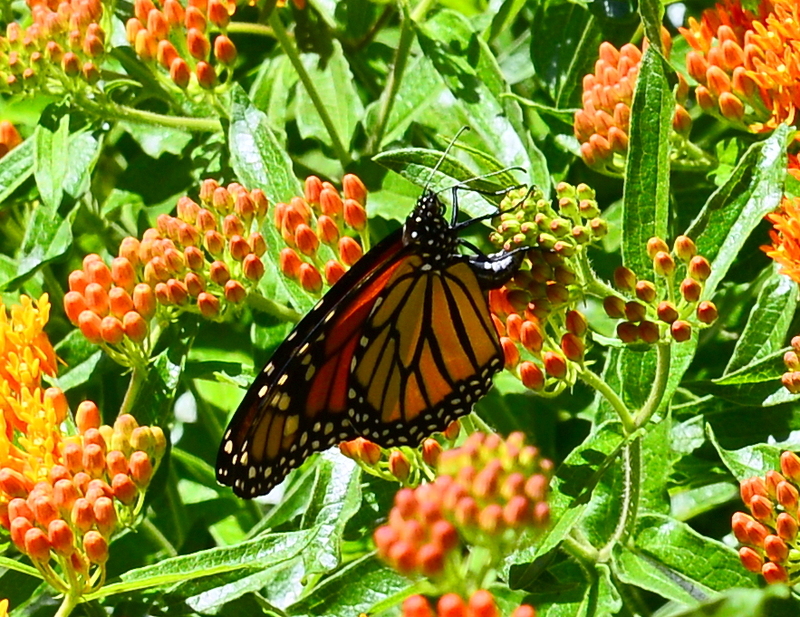 When monarchs look for milkweed, they hover over or barely touch each plant. If it’s not milkweed, they move on immediately; if it is, they seem to check it out carefully. lighting on different parts of the plant, sometimes nectaring if it’s in bloom. I think this individual finally decided to lay eggs. Take a look at the photo below: she curves her body beneath the plant as many butterflies do when they deposit eggs, although I’ve never seen a monarch do this in a flower cluster before. Usually they choose a leaf. But you can bet I’ll be checking this plant for pupae. 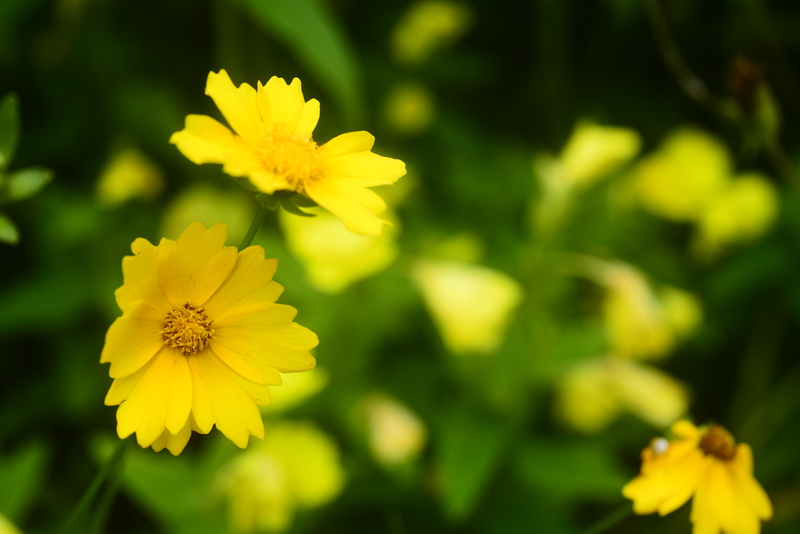 Lanceleaf coreopsis (Coreopsis lanceolata) blooms enthusiastically in June. We’ve finally had a decent amount of rain, and the garden is showing its gratitude by flaunting its early summer colors. In the past week, milkweeds, beebalm, native verbena, and new jersey tea have all come into full bloom, as early bloomers like Penstemon and columbine continue their display. Bird activity has switched over from mating to child rearing: nests are everywhere, and I surprised catbird fledgings (who are at least as noisy as their parents) four times this week. Spring planting is finally winding down. It’s time to concentrate on the vegetable garden, to do some weeding, and to enjoy summer’s beauty. — water new plantings: we got over an inch of rain this past week, so no watering is needed now, but keep watching. Any week in which we receive less than an inch of rain, water all woody plants installed this spring or last season. Perennials planted last spring should be well-established, but those planted last fall and this spring need supplemental watering during dry spells. How do you know when we’ve received an inch of rain? 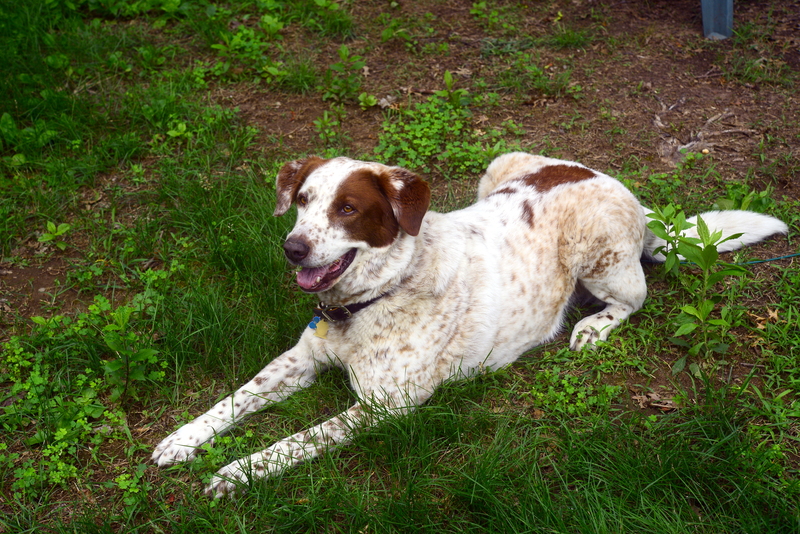 I use a highly sophisticated rain gauge–an old yogurt container placed on the ground among the plants. A tunafish or catfood can works equally well. — practice good horticulture with warm-season crops such as tomatoes, peppers, squash, eggplant, beans, corn, and cucumbers: Monitor for insect eggs and larvae and remove them before infestations become serious. Throw out badly infested or diseased plants to prevent the spread of disease (do not compost diseased or infested plant material). Look at this post, this one, and this one for basic information about growing tomatoes. It’s father’s day, so don’t make dad do any chores! Enjoy the garden this weekend. 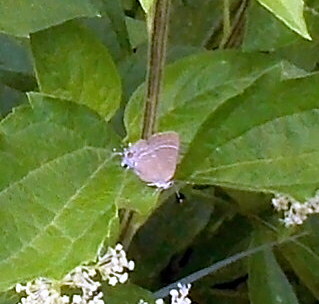 Northern hairstreaks (?) mating on a leaf of Rudbeckia subtomentosa. I’ve seen a stump-tailed catbird fledgling on the ground almost every day this week. I think there must be one nest in a dense Virginia creeper vine growing up the garage wall (about a week ago, there was half a turquoise-blue eggshell on the ground under the vine) and another perhaps in the holly outside my office window. One fledgling was on top of the compost pile, which is beneath the holly. The parents have been continually arriving with caterpillars, in the interim gorging themselves on the ripe serviceberries outside the back door. It’s been a great show! The image above is from the website of Project Noah, an organization that links citizen scientists who participate in investigations of wildlife all over the world. Check out the great wildlife photos! 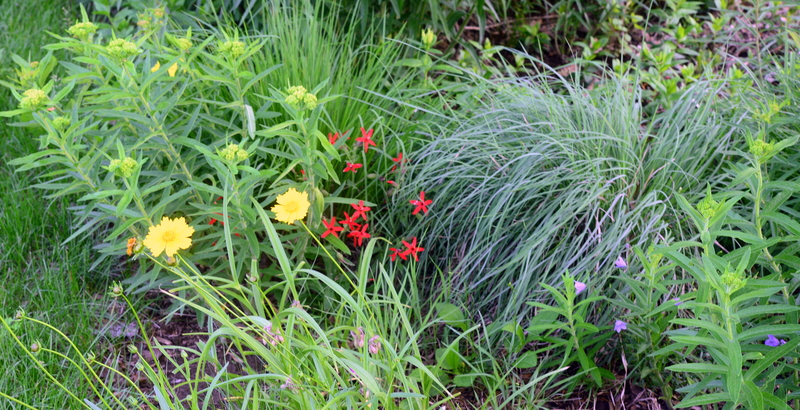 A garden composed of sun-loving native perennials and grasses in early June. This garden includes over a dozen species and will be in bloom until November. It never receives any water or fertilizer. It is planted in an area that used to be lawn. Most suburban landscaping is based on a very few species of plants that evolved in many different parts of the world: weeping cherry trees, Japanese barberry shrubs, boxwood, cherry laurel, leatherleaf viburnums, cultivars of euonymus, hostas, daylilies, yew. Those are the plants that garden centers sell and that landscapers supply. People buy them because they are green and available and, in most cases, tough and long-lived. As a result, most backyards and shopping malls and public spaces throughout the country look alike and are lacking in many of the ecological services that plants should supply. Ecological services include slowing down the movement of stormwater to prevent flooding, cooling and cleaning the air and water, and feeding wildlife. A landscape composed primarily of lawn and a few nonnative shrubs and trees provides few of these services; in contrast, a landscape composed primarily of native trees, shrubs, perennials, and grasses supplies them all in abundance. On a very basic level, if you want to see birds and butterflies, you need native plants. Butterflies rely on specific host plants to complete their life cycle, host plants that will be native to the region where the butterflies evolved. The other side of the coin is that birds need caterpillars to feed their young, and native trees and other plants are hosts for the caterpillars of thousands of butterfly and moth species. That specific benefit–attracting birds and butterflies–is fairly easy to see. It’s harder to see the wider ecological benefits, but they are nonetheless there: More lawns and hardscape mean more flooding after severe storms. More pesticides and herbicides mean polluted water. More lawn fertilizer means ponds and lakes overgrown with slimy, icky algae. Improving our ecosystem is just one of the reasons to plant native plants. There are many others: Native plants are easy to care for, since they are well adapted to our climate and soil. This means that they require less water and fewer chemical inputs of all kinds than the exotic plants that most people plant. This in turn saves you time and money and benefits the environment. Native plants are beautiful, as I hope the pictures on this blog show you! When you plant natives, you help restore our local environment by supplying the foods our native butterflies and birds depend on. Finally, you help restore a sense of place: northeastern North America, the place where we live, is a different ecosystem from Europe or Asia (the sources of most common garden plants). It has its own unique combinations of climate, soil, plant and animal life. Planting natives is one way to celebrate our uniqueness. 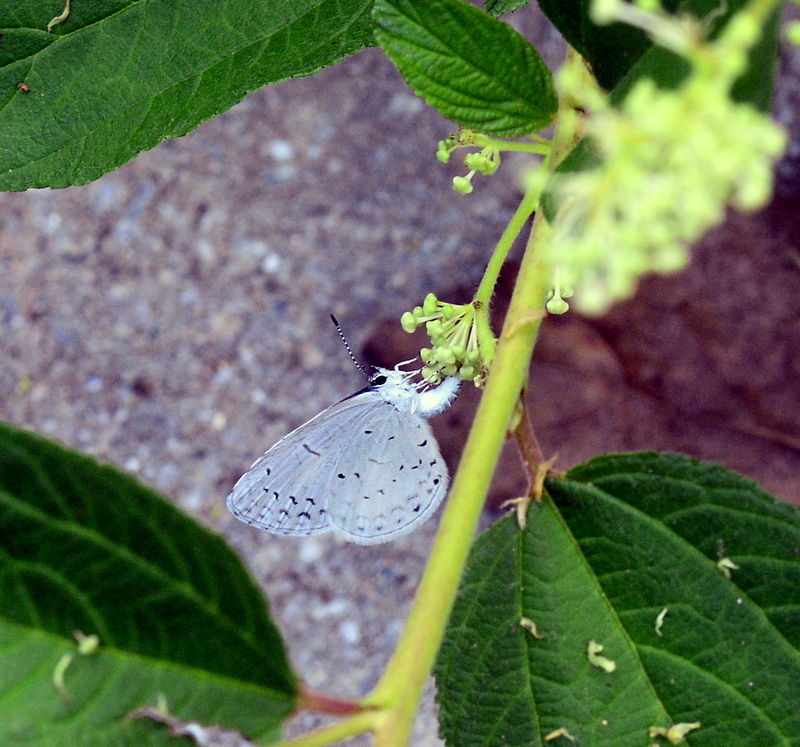 Every year at this time, as the dogwood shrubs finish blooming and the new jersey tea starts, we watch many spring azure butterflies taking flight and laying eggs. Their larval food are the flowering parts of native dogwoods, viburnums, and new jersey tea, so one generation seems to emerge with the dogwoods, especially red osier dogwood (Cornus stolonifera) and lay its eggs on the new jersey tea. Yesterday afternoon two females were checking out the backyard perennial garden and laying eggs in the ceanothus flowers. I believe the females have more black on their wings than the males. The ones we saw yesterday looked very much like this. 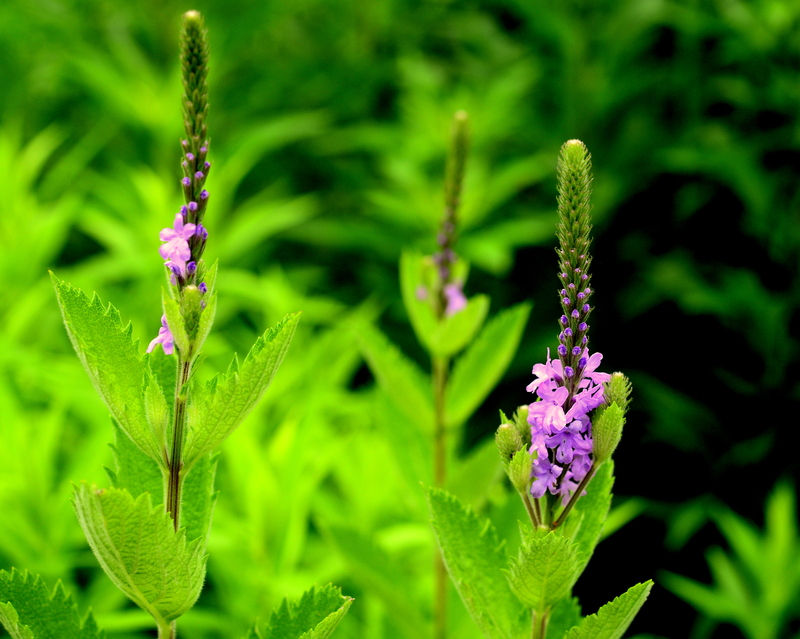 Summer-blooming perennials tend to be large plants with bright, flashy flowers. They reach to the sky and flaunt their colors boldly. I’m not complaining! But sometimes it’s nice to notice plants with a delicate, subtle beauty. 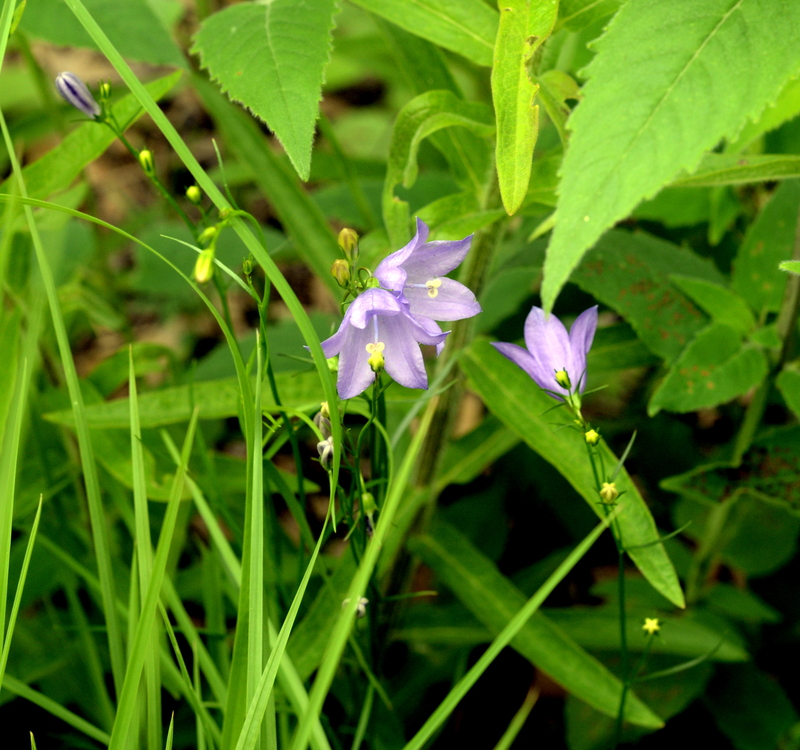 Harebell, shown above, looks delicate but is an extremely sturdy perennial. It blooms from June to August, takes a brief rest, and then reblooms in September and October. It thrives on poor, dry soil–it would make a great rock garden plant–and asks for nothing but sunlight. It’s about a foot high (those lovely flowers are roughly the size of quarters). Daisy fleabane is a native annual that appears every spring in my garden. There are at least two very similar species; I think this is Erigeron annus. It self-seeds all over the backyard lawn, and I dig the plants up as soon as I recognize them and place them around the perennial gardens, where the small white flowers supply welcome contrast to the bright colors of most early perennials. 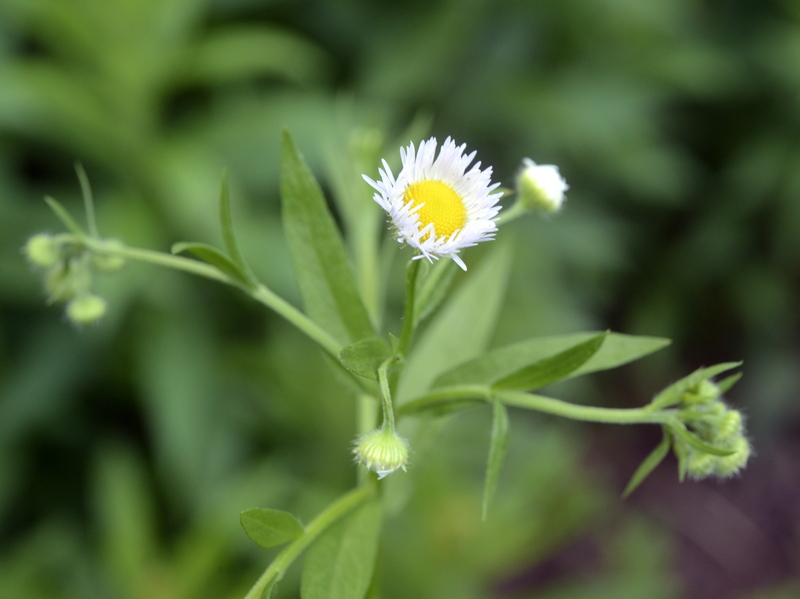 Like asters, rudbeckias, echinaceas, and many other of our most iconic native flowering plants, daisy fleabane belongs to the Asteraceae, or aster family. It’s one of many native species, including at least four different asters, that have arrived in my garden on their own.